Our team had another successful day of surveying damaged buildings in Tacloban, Philippines. The engineers have done enough of the survey work now that they know what to look for, noting similarities and differences between sites. One thing that begins to sink in after going through these damaged buildings is the massive scale of the disaster. As an engineer in the U.S., I review damaged and deteriorated building conditions as part of my business. The difference here is not only the severity of the damage caused, but its extent. We have spent days and days looking at damaged buildings, and have not scratched the surface on what could be seen. 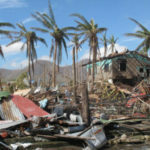 Typhoon Yolanda was a serious storm that really hit this region hard. Schools, government offices, residences, and commercial buildings were all affected. And yet, life goes on. Temporary buildings have been erected and school classes are being held in tents. We see this as we visit partially occupied facilities. 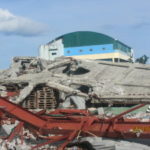 The rebuilding effort required is massive, and although it has been underway for six months, there is a long way to go. The morale of the team is good. All are in good spirits and the working relation is compatible. In fact, the group dynamic of deference-to-the-other is in place. Due to the hotel shortage in Tacloban, four of us had to share a hotel room. When it came time to select beds, there were the usual comments of “take whichever one you would like.” As such it left [team member] Jean-Paul Pinelli with the largest bed and Shenen Chen, the team leader, with the smallest. Probably not as we would have anticipated, but all worked out well. The grief Jean-Paul has gotten for that decision will recede in a day or two. That will probably be the last “all-nighter” of my life with civil engineering professors. I am okay with that. It has been the same thing with meal choices. Nobody is bringing strong opinions to the dinner table, so we are eating consensus choices (with rice, of course). A good source for calibration of expectations of construction practice has been our Department of Public Works and Highways (DPWH) engineer. After witnessing the manufacture of locally batched concrete, with materials spread out on a roadway and a (barefooted) man mixing with a shovel, I had a discussion with him about quality control and assurance. He admitted that it is a problem. There is knowledge of good practices held by engineers and some construction company owners, but it does not always make its way down to the level of the foreman as much as it should. In fact, there are only two testing laboratories in Tacloban: one private company and one DPWH facility. Needless to say, cost significantly limits materials quality validation in Philippine construction. This situation is more prevalent in regions such as this, outside Manila, according to our companion. Another thing about a trip such as this is to see first-hand how affluent the U.S. is in comparison. The Philippines is a very poor country in many places. The general level of income, standard of living, and infrastructure are much less than in the U.S. Most of the people of the Tacloban area earn a living by fishing, farming, or as simple merchants. The economy here does not offer nearly the opportunities as the U.S. This is observed in many ways beyond the obvious situation of noting how many individuals are living in simple structures clad with metal panels, without indoor plumbing or electricity. We are fortunate that we are able to joke about the large and small beds in a hotel room. When a comparison is made, we understand that there is nothing to complain about. Count your blessings to live in the U.S.
On Saturday, May 3, a team of seven civil engineers from ASCE’s Technical Council on Forensic Engineering, in cooperation with the Technical Council on Wind Engineering, left for the Philippines on a week-long mission to conduct post-disaster assessments, documenting evidence of structural and geo-system damage to historic and residential structures and public infrastructure. Mark E. Leeman, P.E., M.ASCE, vice president of Facility Engineering Associates of Fairfax, Virginia, chronicles the team’s experiences in this exclusive daily report for ASCE. This is the sixth installment in the series. it is very hard to repair then constructing a thing.